Preface. Suicide: The Problem. A Theoretical Approach to Understanding Suicide. 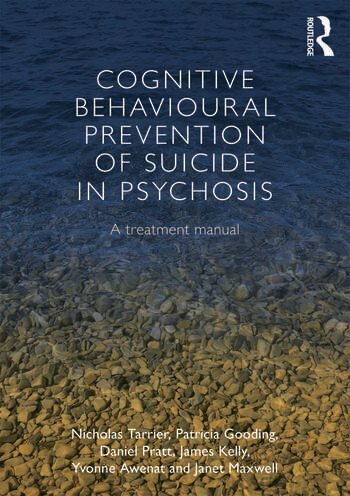 Does Cognitive Behavioural Therapy for Suicide Work? Pre-Therapy: Engagement and Assessment. Formulating the Prevention of Suicide. Clinical Techniques and Implementation of CBSPp Protocol. A Case Study in Suicide Prevention: Mark. A Case Study in Suicide Prevention: Peter. Overcoming Difficulties in Implementing CBSPp: Maintaining a Hope for Hope. People and Suicide: Lived Experiences of Suicidality and Involvement in Suicide Prevention Research. Future Directions in Clinical Research and New Technologies. Nicholas Tarrier is Professor of Clinical Psychology at the Institute of Psychiatry, Kings College London, UK. From 1991 until 2011 he was Professor of Clinical Psychology at the University of Manchester, UK, and Consultant Clinical Psychologist in the NHS. He has pioneered the development and evaluation of cognitive behaviour therapy for schizophrenia and other psychological disorders. Patricia Gooding is a Senior Lecturer at the University of Manchester, UK. Her research focuses on understanding the psychological mechanisms that lead to suicidal thoughts and behaviours, and also on understanding the psychological mechanisms that confer resilience to suicidality. Daniel Pratt is a Lecturer in Clinical Psychology at the University of Manchester, UK, and a Clinical Psychologist for Manchester Mental Health and Social Care NHS Trust. For the past ten years, he has conducted research investigating psychological models and interventions to prevent suicidal behaviour. Dr Pratt is currently conducting a feasibility trial of a psychological therapy for suicidal prisoners. James Kelly is a Senior Clinical Psychologist working at Lancashire Care NHS Foundation Trust within the Early Intervention Service. He has published on the use of mobile phone technology to scaffold the delivery of cognitive behavioural suicide prevention therapy in real world settings. He has an interest in suicide prevention, cognitive therapy for psychosis and compassion focused therapy. Yvonne Awenat has been involved in mental health research for the past four years following early retirement due to ill health from her former position as a Consultant Nurse. She now uses her personal experiences of mental distress combined with prior expertise as a NHS clinician to promote mental health research and services that reflect the needs of people with mental health issues. She is Honorary Research Fellow, School of Psychological Sciences, University of Manchester, UK. Janet Maxwell is a Clinical Psychologist whose doctoral research focused on cognitive behavioural and family interventions for psychosis. She has worked in private practice and public mental health services in Australia and also as a research therapist in the United Kingdom, delivering psychological therapy aimed at preventing suicide in individuals experiencing psychosis.